You will never guess what we have in our back yard. It is something I have needed for a long, long time and hopefully it is something that will help save my sanity from the grasshoppers that have infested our place for the last 3 years. OK – it’s not therapy but that might have been cheaper in the long run. HA! 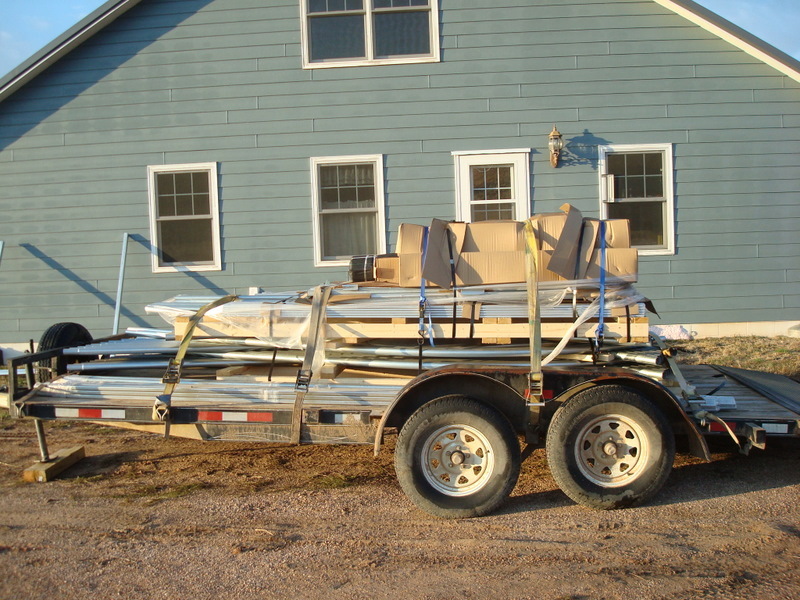 It fits on a flat bed trailer and looks like a bad accident. Or a giant jigsaw puzzle. From this photo only one thing is obvious to me – whatever it is – it’s going to be a challenge. Ahhh!!!! Another new project – I must be crazy. I haven’t finished Nadine yet and now we have this sitting in our yard. It’s a hoop house – basically, a plastic covered greenhouse without additional heat. 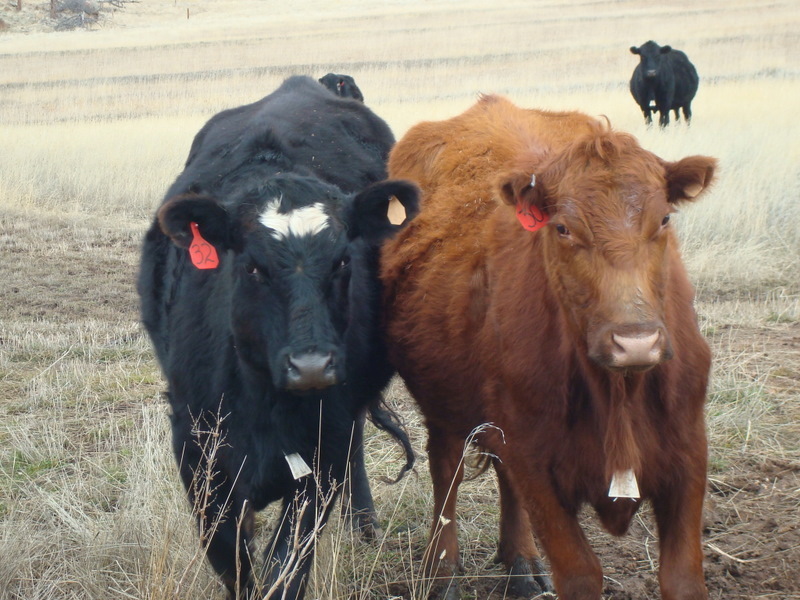 South Dakota is one of the states chosen for a pilot program with the Natural Resources Conservation Service (NRCS), Environmental Quality Incentives Program (EQUIP). 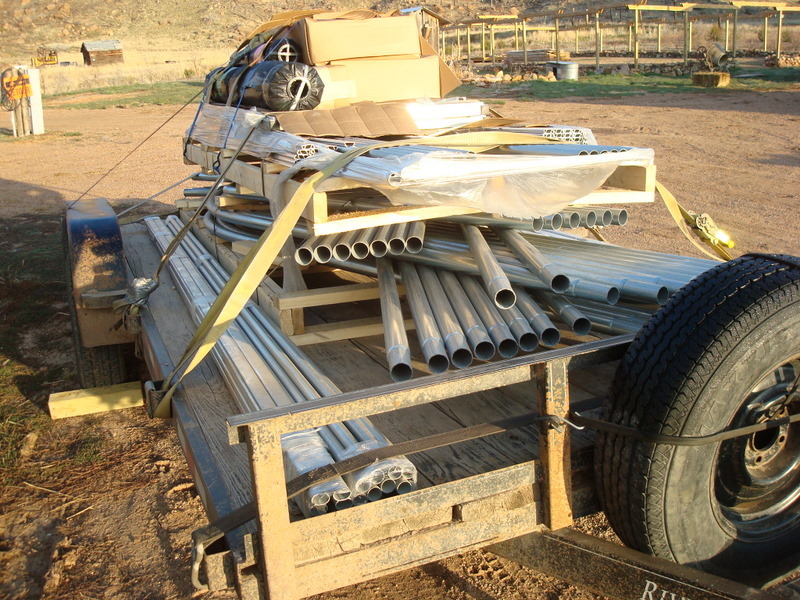 EQUIP is split into several conservation programs – water projects, sage grouse protection and one for hoop houses. There are other ones too but these are the main 3 we hear about in SD. 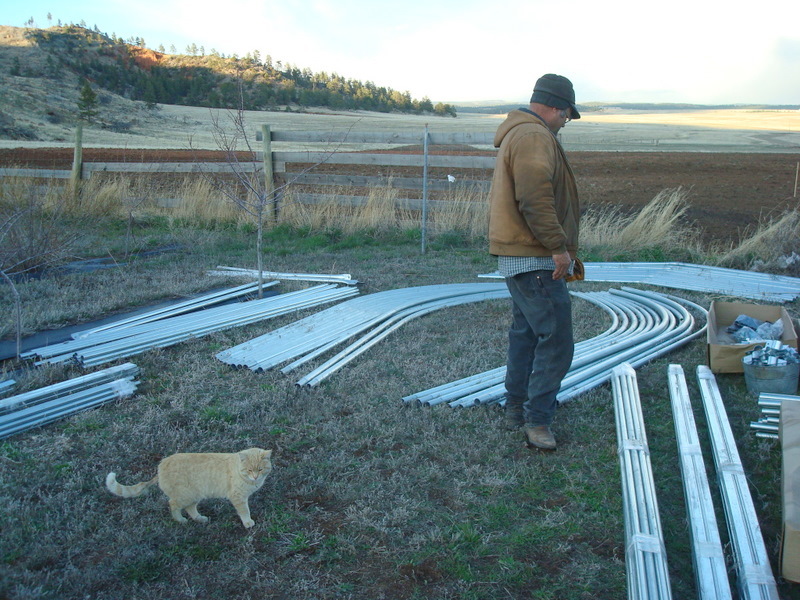 This program is meant to encourage the organic production of vegetables and specialty crops by helping ranchers and farmers purchase hoop houses on a cost share basis. It’s a wonderful idea and we were one of the lucky ones who qualified this year. We have heard there hasn’t been much interest in this program so it may be one of the programs cut with the new budget. For the last few years I have been trying to sell vegetables at the local Farmers Market and fall festivals. The demand is defiantly there – especially for fresh veggies grown organically. Everyone has been very encouraging and very eager for more than I can produce – especially when we have to share with millions of grasshopper so hopefully this will help. That is – if – we can get it put together. But at least Julio (the cat) is there to help. Even though he doesn’t have thumbs, Julio does what he can – like rubbing against your leg and letting you know that he loves you even if you’re an idiot and can’t understand what the instructions are trying to tell you. It’s OK.
It’s good to have warm, fuzzy friends. Sometimes you just need a warm, fuzzy hug. For me it’s easier not to look at the whole project because that can send me running home to my mommy or down to the corner bar. Instead I tend to break the big jobs down into lots of smaller jobs. Instead of one big job – we have about 583 small jobs to do before I can plant seeds. Then it’s not quite so scary. 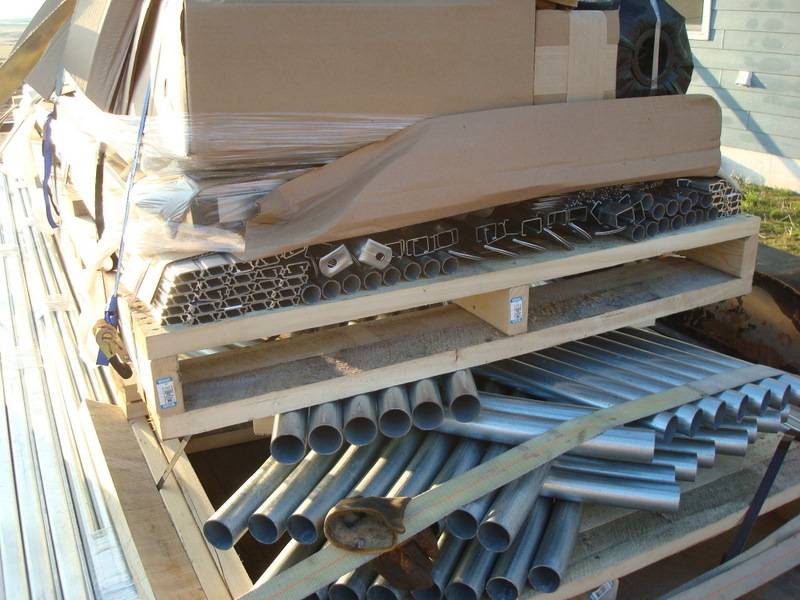 Especially when you have good help – last night our neighbor, Paul and I were in charge of unloading the trailer and counting all the parts. Today Hubby digs in the new water line and installs the hydrant. Then it’ time to lay it out on the ground with stakes and string so it’s square (actually rectangular) and then we start digging post holes for the ground stakes. What a great evening Wednesday night!!! It was 43 degrees outside with very little wind so of course (since it’s April) I was gardening. I was gardening in my winter coat and stocking hat but I was still gardening. I have always figured if you can stand to be outside for more than half an hour without your coveralls then it must be time to start gardening. That’s South Dakota for you. The first thing I did was spray some weeds. Tell me, how is it possible that the snow has just finally disappeared and there are already a bumper crop of weeds? It’s just not fair. I never spray chemicals in my vegetable garden but anything that rears its ugly head through the gravel of the Wedding Garden is fair game. Guess what we have coming up in there – oats, lots and lots of oats. Of course it’s because we threw oats instead of rice at the newlyweds so it’s my own fault. After taking out my frustrations with a spray bottle of herbicide I spent the rest of the evening planting onion sets and cleaning up inside the little greenhouse, turning over the soil and getting it ready to plant. I worked until it was too dark to see. Thank goodness turning over soil is not difficult work and since it was pitch black when I decided to head to the house I was also thankful for the solar lawn light I happened to have close by. I’m sure I looked like the Statue of Liberty coming across the garden to the house holding the light by the ground spike over my head. It’s true – I’m a very patriotic gardener. It was a touching moment but when I stepped into the kitchen I forgot all about that because I saw something on the corner of the kitchen table that I thought you might like to see – Hubbys record book. If you live with a rancher or farmer you already know what a record book is. Every rancher keeps one. Most men will choose a new one every year, like the changing of the guard at Buckingham palace it is a ritual worthy of much thought and planning. Most record books are small notebooks that can fit into a shirt pocket – like the proverbial ‘little black book’ but for ranchers and farmers they can be any color – except pink – I have never seen a pink one. And because all ranchers and farmers are cheap, almost all record books come with advertising on their imitation leather covers. 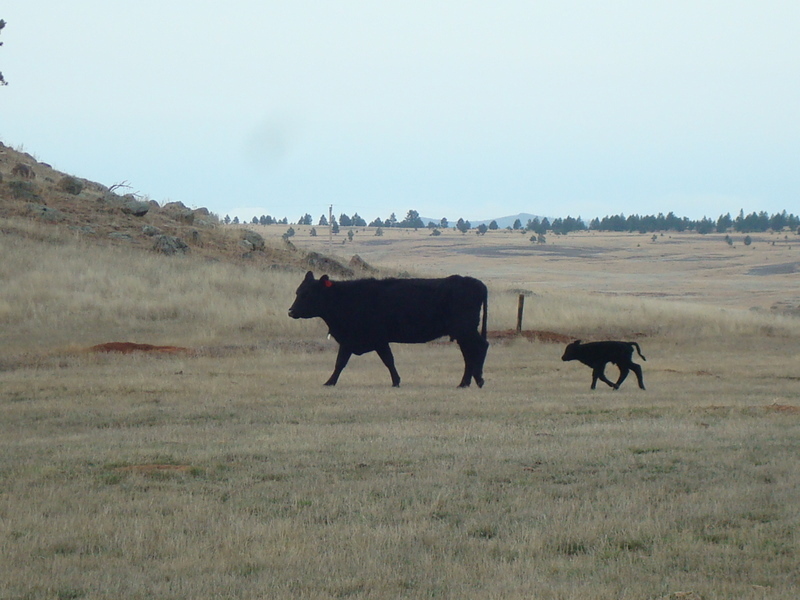 You might see ads from a feed store, seed company, the power company or even the neighbors annual bull sale. Those are my favorites. Ranchers and farmers write down everything into these small books – weather conditions, cattle health records, the phone number of a guy with hay for sale and I’m betting there are deep, dark secrets in there too. I have never really checked out this theory but I’m pretty sure it’s true. In my line of work I have had access to many ranchers record books and I have been watched like a hawk from the moment I got their book into my grubby little hands until I have carefully handed it back. I guess it would be like me handing over my journal – it would make me nervous too. I have seen grown men literally tear a house apart looking for their misplaced book and if the absolute worst should happen and the book goes through the washing machine you might as well pour yourself a stiff drink and start thumbing through the yellow pages for a good divorce lawyer. It happened to me once. I was horrified to open the washing machine and pull out the soggy, mangled pages of Hubbys record book. There was no hope of salvaging it. The only thing that saved our marriage was that it was in January and he hadn’t had much time to write important stuff in it yet. It was a close call. Most men I know carry these small books with them where ever they go but occasionally, they have been known to forget their book and then what do you do? You make do with whatever you happen to have on hand. 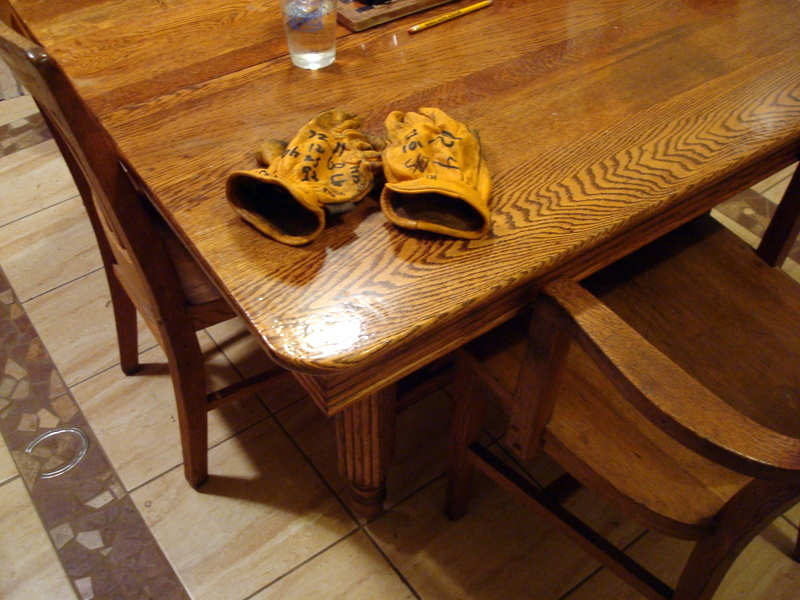 I know – it looks like an ordinary pair of dirty old leather gloves, but look closer. 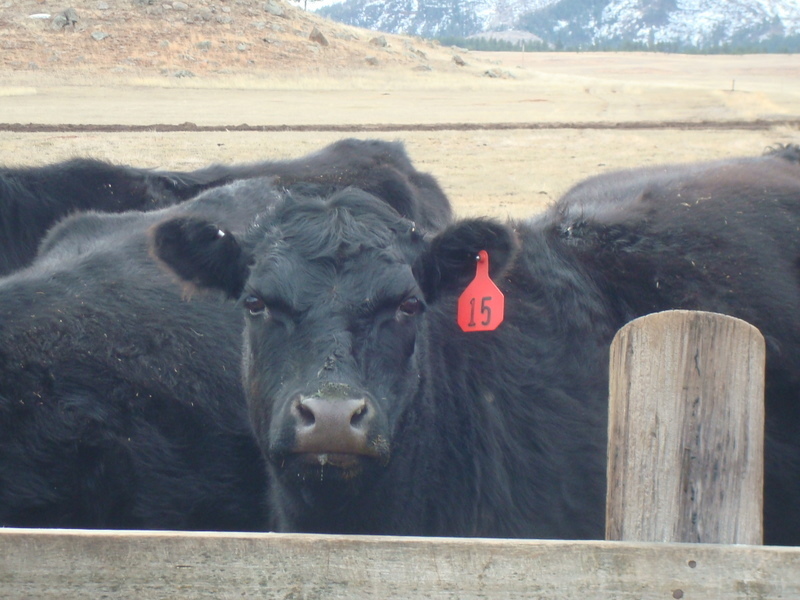 Those are ear tag numbers from calves – it’s a regular register of new babies. Remember #53 the mini bull with attitude? Yep – There he is. 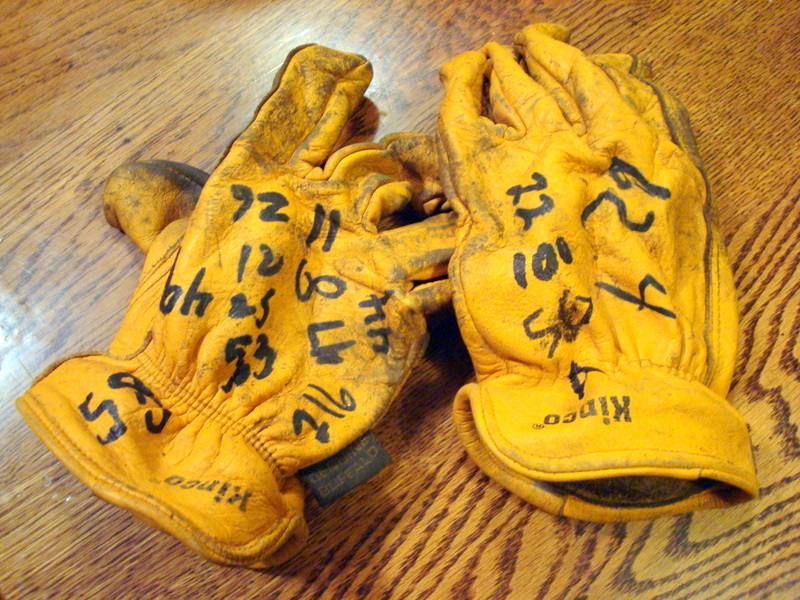 I only count 16 tag numbers on these gloves but I know there are many more calves than that out in the field so I guess Hubby must have remembered his record book most of the time but everyone has had a few of those days when you leave home without the things you need. On those days – you must adapt. At times, you even have to be a little creative and believe me ranchers are very, very good at this. If you don’t believe me just check out this fence repair job. You can’t see it very well from this photo but that old wooden fence post is totally rotted off at the bottom. The only thing holding it up is the steel fence post – well, that and the fact that the wind generally blows from the west most times. It is a modern marvel of engineering that has been standing like this for at least 4 years (that I know of) and with the way things go around here it’s probably going to out last the rest of the fence. I have seen artwork in galleries with $30,000 price tags that aren’t as fascinating to me as this simple fence post. 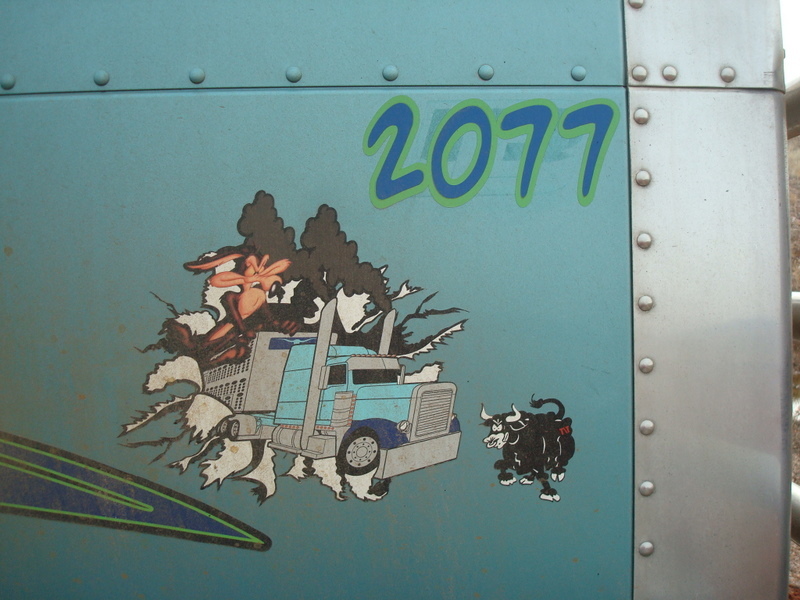 I’m not sure why that is – perhaps it reminds me of the ancient conflict of mankind, depicted by the use of both old and new medias that makes me think of the old rancher, weathered and knarled, reluctantly turning over the reins of ownership to the next generation. Or perhaps it’s the symbol of strength portrayed by the single metal fence post that supports not only the weight of the old wooden post but also the fence lines running in two different directions. Steadfast and without complaint, it holds everything together – supporting the weight of the world on its rigid frame. 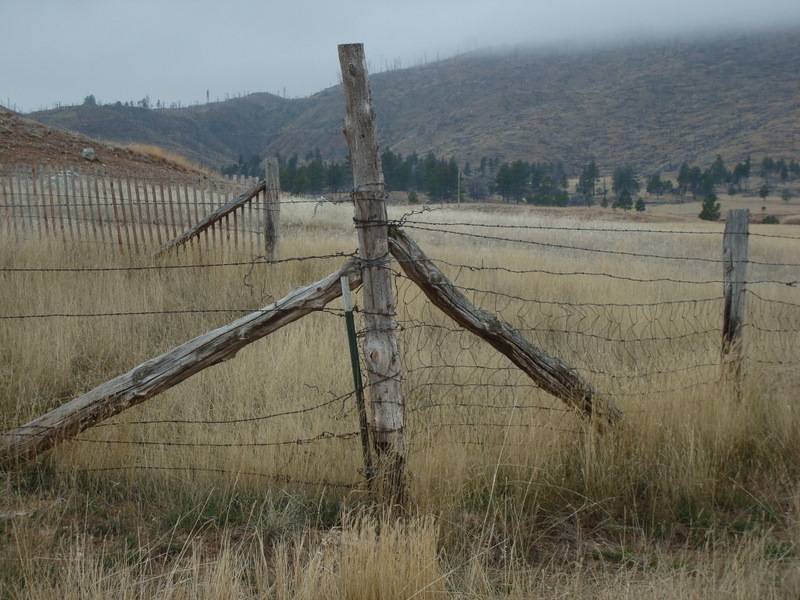 But more than likely it reminds me to send a prayer toward heaven for the strength – like that fence post – to hold things together for just one more day. We have had a busy weekend – the kind of weekend I like. A weekend with a house full of family and friends and a weekend where we got a lot of stuff done. 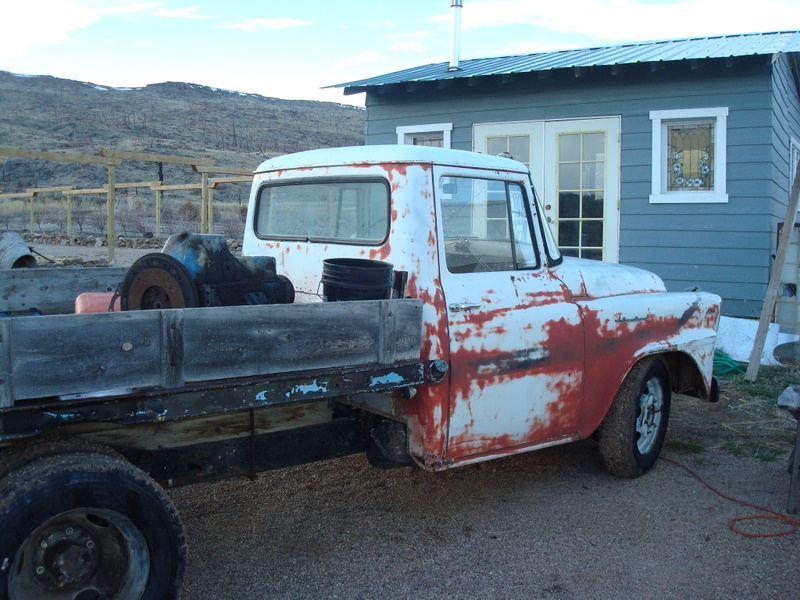 The first project was the blue pickup. 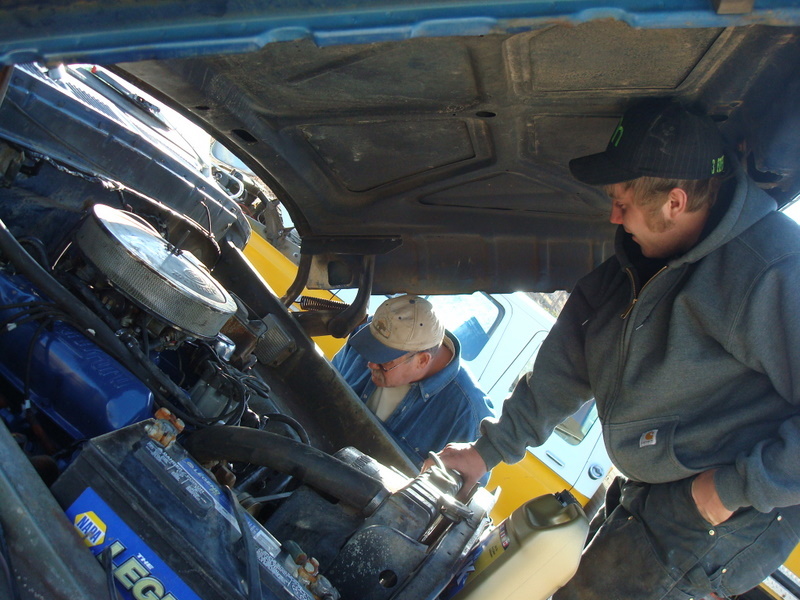 Morgan, his buddy Caleb, Hubby and the neighbor Paul spent Saturday putting a rebuilt engine into the old Ford pickup that has been broken down, gutless and parked by our kitchen door for almost 4 1/2 months. Believe me – it was time. Here’s Morgan running the back hoe. He’s primed and ready to lift the engine ever so gently. 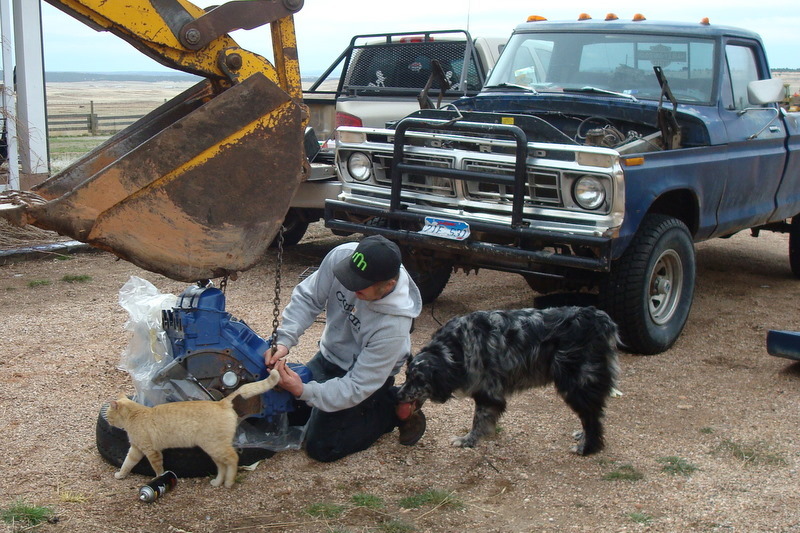 And on the other end of the hoe is Caleb with lots of help from Casey the dog and Julio the cat. You may have noticed the strange hair style going on at the base of Julio’s tail. Please do not contact PETA. This was not some mean-spirited joke played on a poor unsuspecting feline. We did not do this – the veterinarian did. 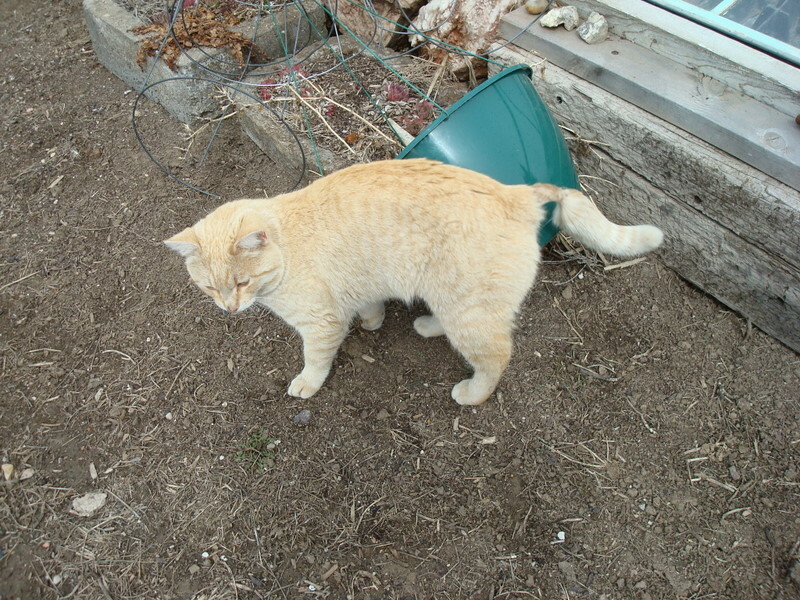 Julio – a rough and rowdy tom cat from town went out ‘catting’ one night and came back with a bad bite on his tail. Since he was a stray that occasionally hung out at the feed store no one really noticed it before it had gotten infected. When Morgan finally saw it he was going to take Julio to the vet clinic after work but as luck would have it Pete the vet showed up at the store for something and ended up loading Julio into his pickup and hauling him back to the clinic himself. It’s amazing the amount of care shown to a lonely old stray cat in our little community. It really says a lot about the caliber of people who live around here – especially our beloved vet, Pete. Anyway – long story short – Julio got his tail shaved and treated and now the wound is healed and the hair is slowly growing back. And Julio (who has been banned from the feed store because he learned how to tear open bags of cat food and milk replacer) has now moved to our house where he lives on the front porch and enjoys snoozing in the nice warm greenhouse. The engine was installed and everything hooked up. Fluids were added and it sounded great once she was fired up. Morgan and Caleb made it to town and back on her first test run and then after supper she moved to Morgan’s house in town. Yipee! No more large blue, 3/4 ton, vintage 1974 lawn ornament in the driveway!!! Life is good. If it had stayed much longer I’d have dumped a load of dirt in the bed and planted petunias. But that wasn’t enough excitement for one weekend – it didn’t stop there. Another thing we got done (or fixed) was something I have worried and stressed about for a month – Dalton fixed the bathroom floor in my camper – Nadine!!! That’s right – Nadine is so cool she now has genuine diamond plate sheet metal on her floor. It’s great to have kids who know metal. Dalton found a piece of rusty old metal in the scrap iron pile. He did some careful measurements, got out the torch – assisted by his wife, the lovely and vivacious Dani. And cut out the perfect piece of diamond plate for Nadine. He also welded rebar supports to the bottom of it to stiffen it so it doesn’t ‘pop’ up and down when I step on and off it. 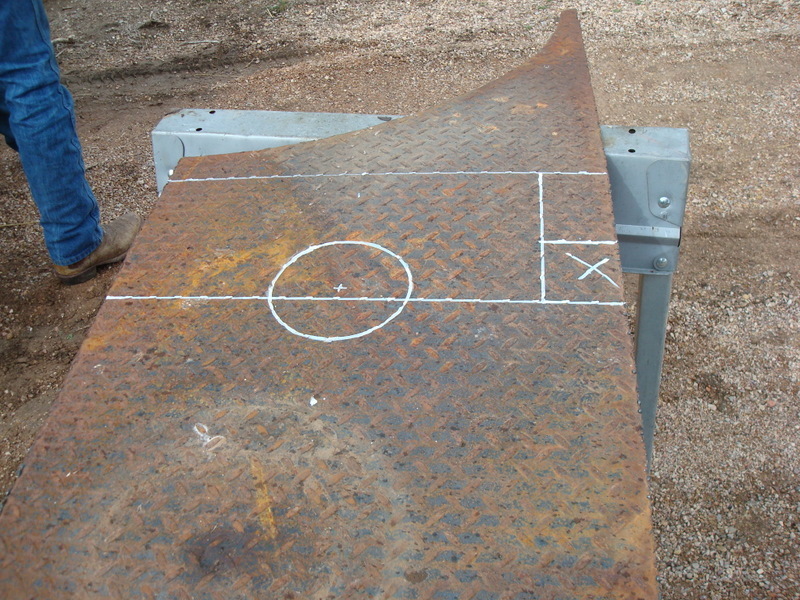 He then used the grinder to get the rust off of it and all the rough spots around the edge. Meanwhile, I dug through the left-over paint supply in the basement and come up with a partial can of primer and a full can of black gloss spray paint. Then, because it was a beautiful day, Dani and Dalton went to catch and ride a couple of horses. Left unsupervised, I primed, painted and glued down my new bathroom floor. That’s why there is a scrap piece of wood and 2 cement blocks adding weight to hold it down. Dalton assures me that if you glue it and let it set for 4 or 5 days, undisturbed it will be stuck down forever. That’s what I’m hoping for as sewage is not my thing. Liquid Nails is a wonderful product. If you can’t screw it – glue it! That’s my motto and it should be theirs. 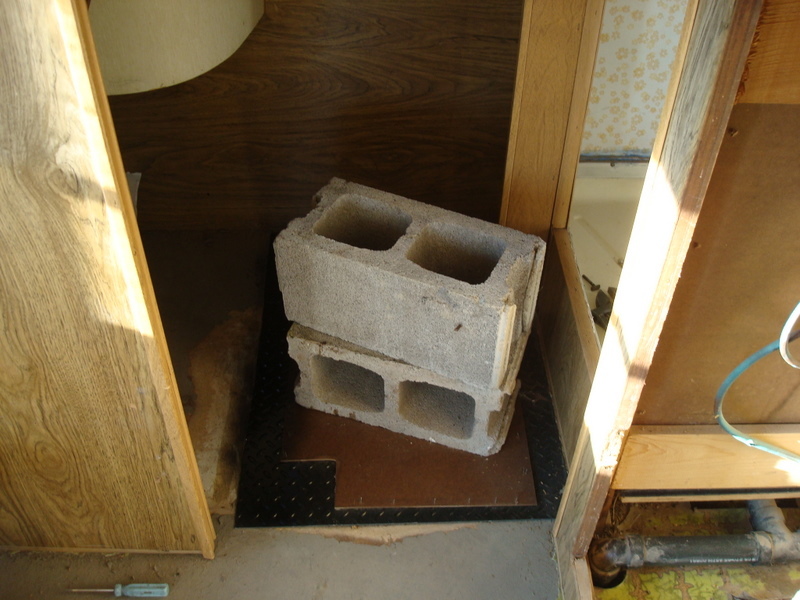 I know right now it looks like a very rustic two-hole outhouse in the back of my beloved camper but under those cement blocks is a floor of steel. 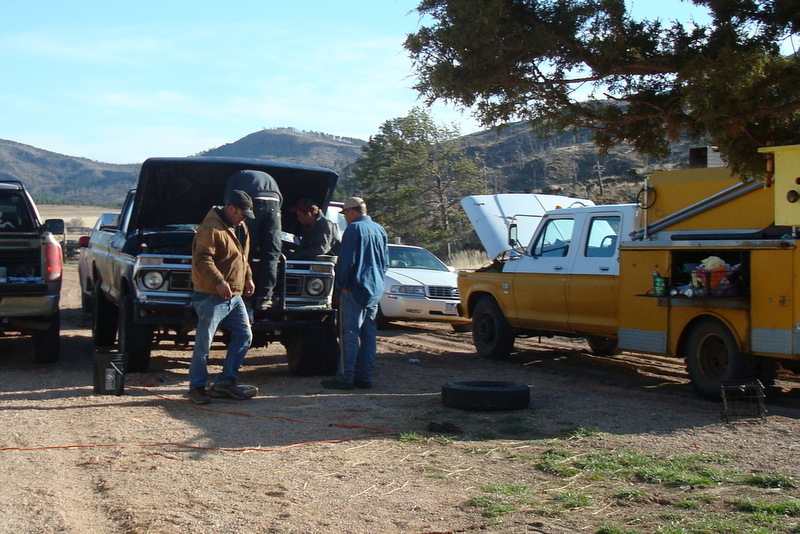 And as for the pickup… How many rednecks does it take to mount an engine? It’s just another day in paradise. But I wouldn’t want to live anywhere els – especially in the spring when you have pastures full of these adorable, sweet, precious babies running around. 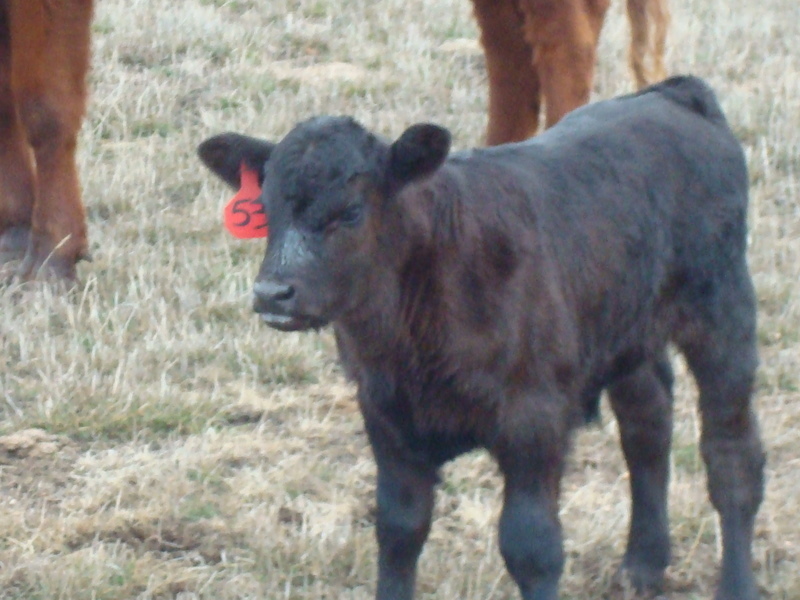 Just check out that face – doesn’t he look like a little, mini bull? All right, already. I’m going. Geese! 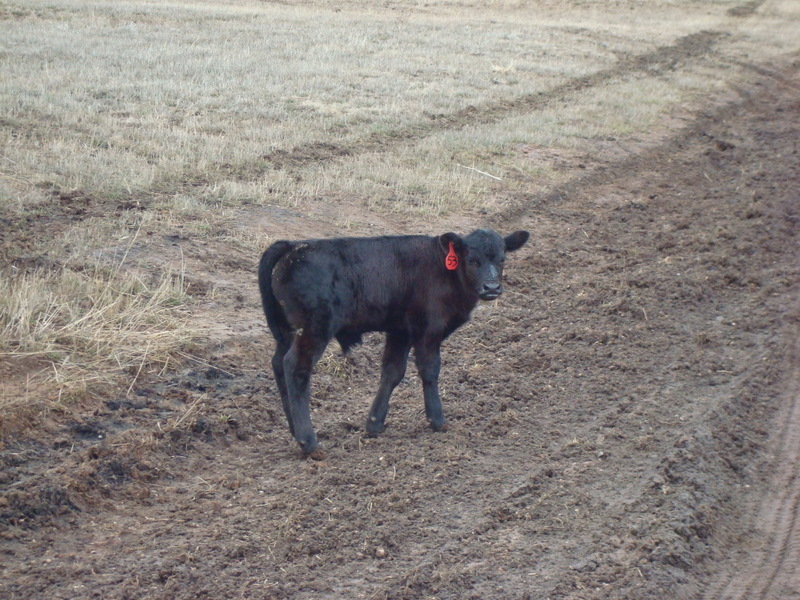 What a lot of attitude for such a little calf. And then we have this sweet little lady. And then there’s this little guy. Last Thursday we started a project. Actually I should say that Hubby started a project. He decided it was time to fix our driveway and after a month of having to use 4-wheel drive to get in and out of our place – I agreed. 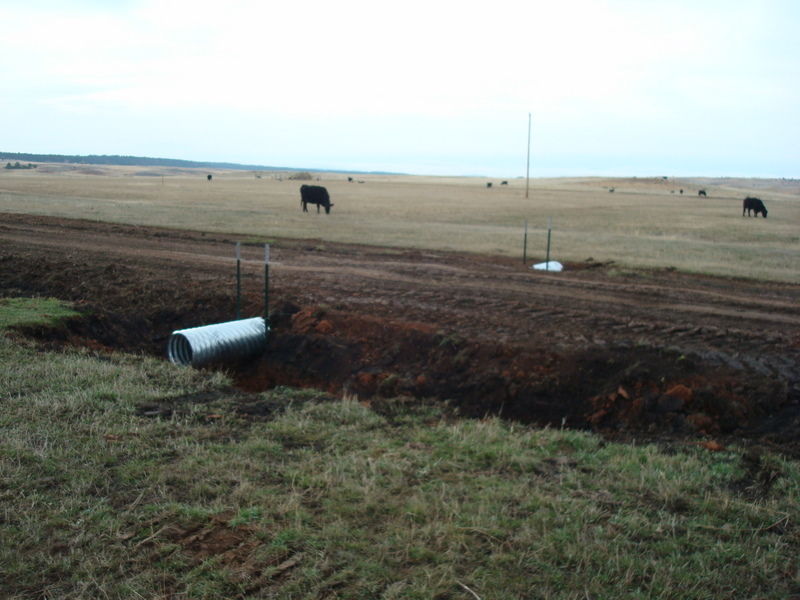 First he brought home 2 new culverts and put them in the low spots. 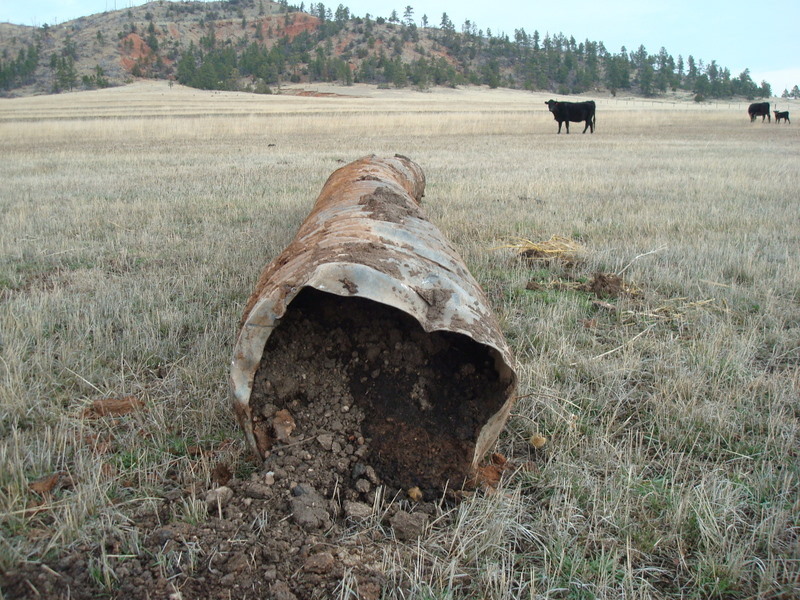 The cows don’t seem to be very impressed by these shiny new tubes sticking out of the ground but I sure am. This is the one he took out. I can’t imagine why the water quit running through it. Can you? You can bet we’ll clean this out and reuse it somewhere but for now it’s set off to the side of the driveway – looking sad and bloated. 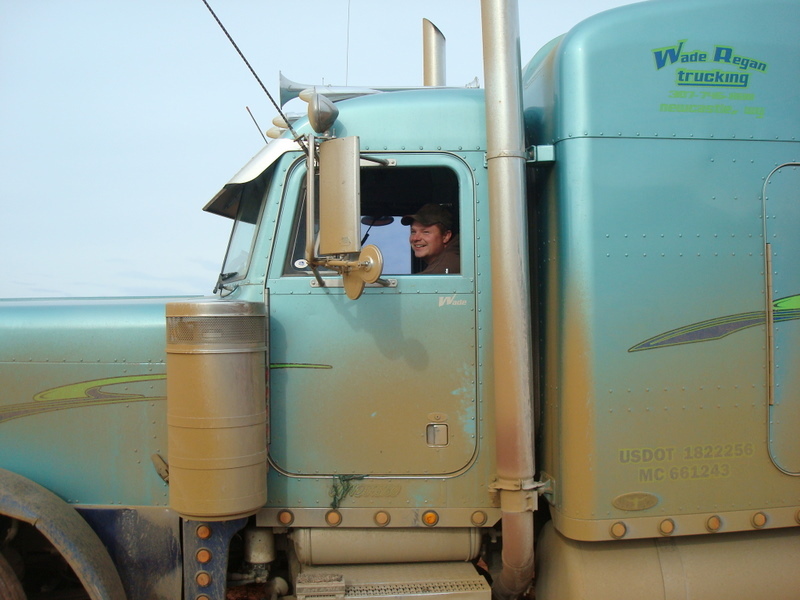 Saturday morning dawned clear and dry so Hubby called in reinforcements – our son Morgan and his friend Wade who just happens to own a truck and belly dump trailer. It’s great to have friends!!! I only saw the beginning of the work Saturday morning as I was headed to Custer to visit my folks and then onto Rapid City for the last curling game of the season but I did get dinner started in the crock pot for them and then I ran around and took some pictures on my way out. The first thing I saw was a momma cow with a brand new baby. 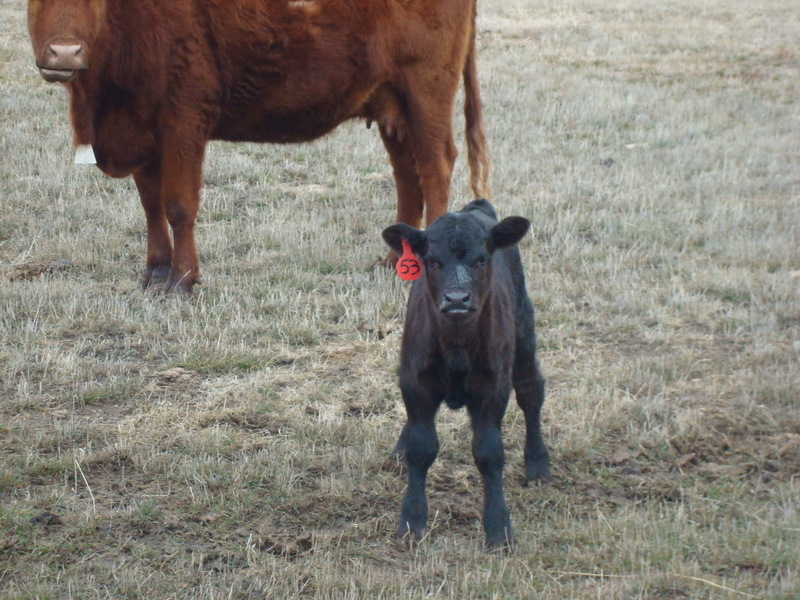 This little one was probably less than an hour old and was already running on his wobbly little legs to keep up with mom. That’s Hubby in the road grader. Every man needs nice Tonka Toys and Hubby has quite a collection. He was in charge of spreading out the gravel so I pulled off the driveway and did my best to stay out of his way while I took his picture. 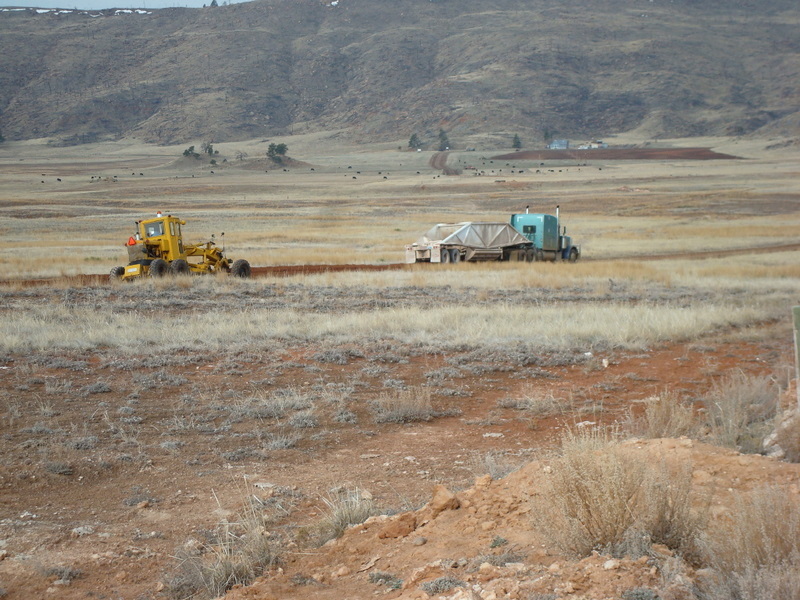 Then, I continued down to the gravel pit where Morgan and Wade were hard at work. That’s Wade standing on his trailer and Morgan running the loader. He’s definitely outgrown the sandbox in the back yard. 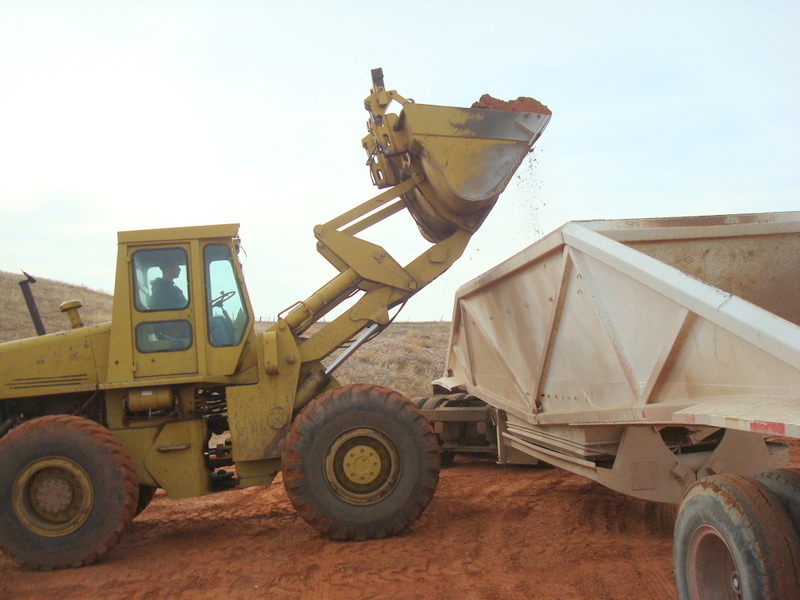 And just check out that trailer – a belly dump trailer is a fascinating piece of equipment. You fill the trailer full of gravel and then drive to the spot you want to dump it. 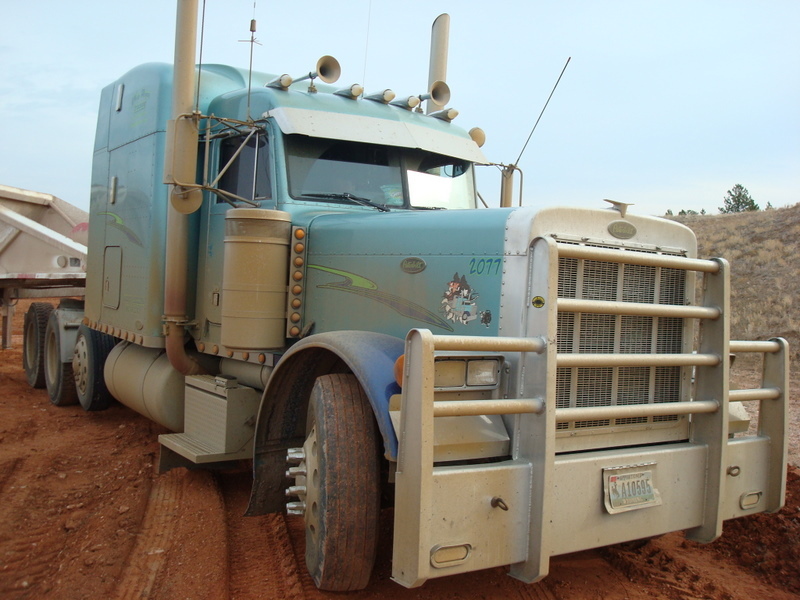 Then, when you get to the spot that needs gravel, you continue to drive while releasing the doors on the bottom of the trailer – leaving a wonderfully neat strip of gravel down the center of the road without having to stop. Did I mention that this loader was my anniversary gift? Yep, you’ve probably heard of the ‘Crystal anniversary’, the ‘China anniversary’ and the ‘Silver & Gold anniversaries’ but I had no idea that the 14th wedding anniversary is the ‘Fiat Allis anniversary’. It’s true – Hubby said he read it somewhere. I do admit this has been a wonderful gift and much more practical than diamonds and furs. We’ve done some pretty serious gardening with this thing – and really – how many other gals can say they have their very own loader… and back hoe… and swather… and even my very own Stihl chainsaw? Yes, I’m a lucky, lucky woman! Morgan thinks so too – he loves to drive the loader. Since the loader is a Fiat Allis we have always called her ‘Fat Alice’. Over the years Fat Alice has moved a lot of gravel, snow, dirt and hay and Morgan is really, really good behind the wheel. 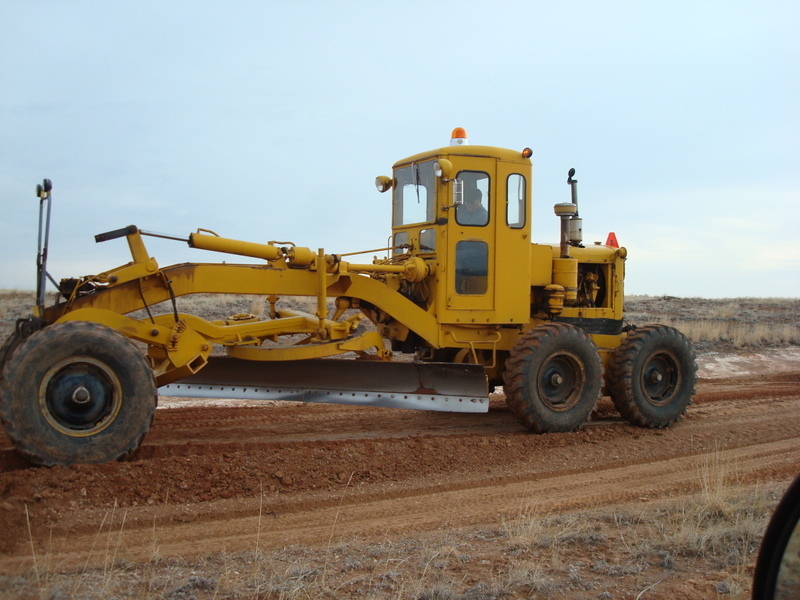 It is amazing how smooth and precise he is with this very large rolling pile of machinery. If you’ve ever spent time around big equipment you soon realize that not everyone is. 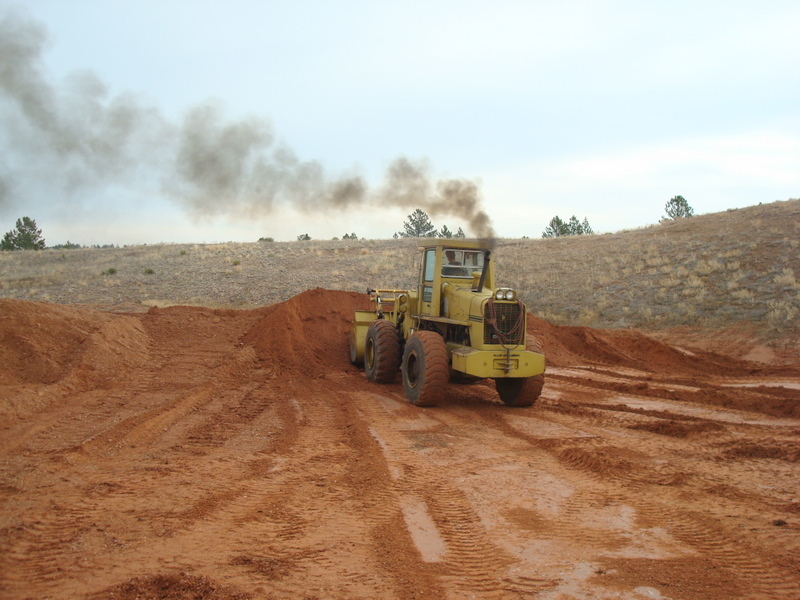 Operating heavy equipment is an art form. Some people have the ‘touch’ and some people won’t ever have it no matter how much practise they get. We’re lucky, both our boys are amazing. Maybe it’s because they learned to drive stuff like this before they were old enough to get their driver’s license. Or maybe it’s because they know that if they break it – they have to fix it. That in itself is a pretty good incentive to pay attention. And Morgan’s buddy, Wade is the same way. 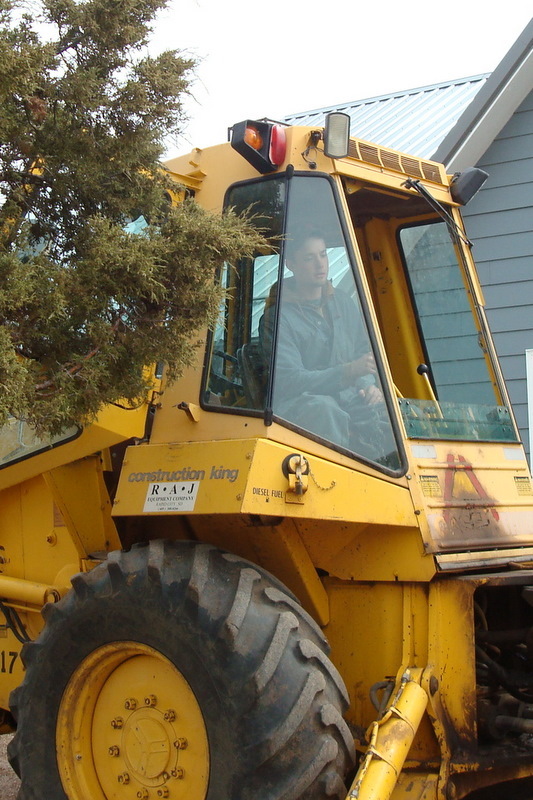 He’s young but he’s a hard worker and I’m pretty sure he can drive anything that moves too. And just look at that smile – he obviously loves what he does. 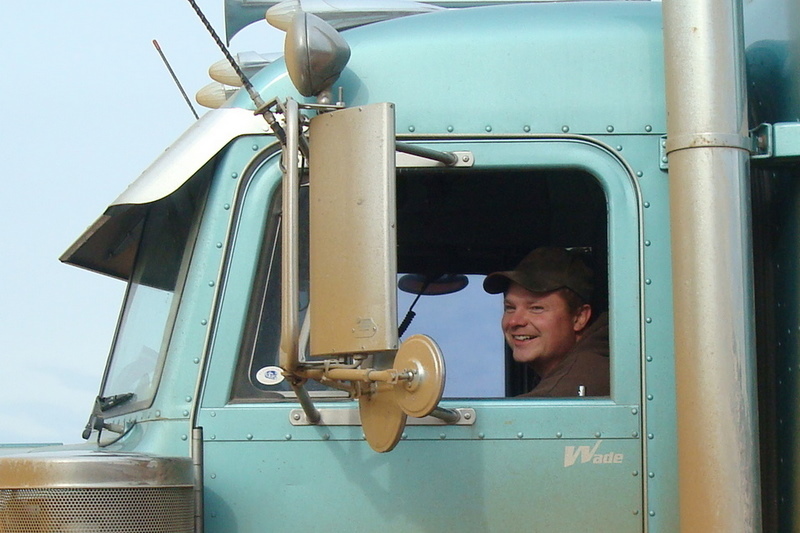 He owns 2 trucks, has one hired man and works harder running his own business than most kids his age even think of. 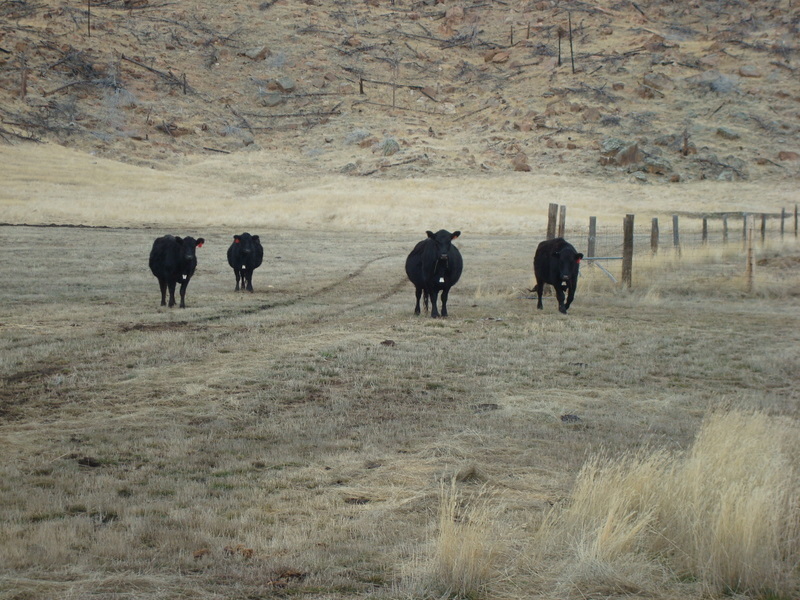 And when he’s not hauling gravel he hauls a lot of cattle. 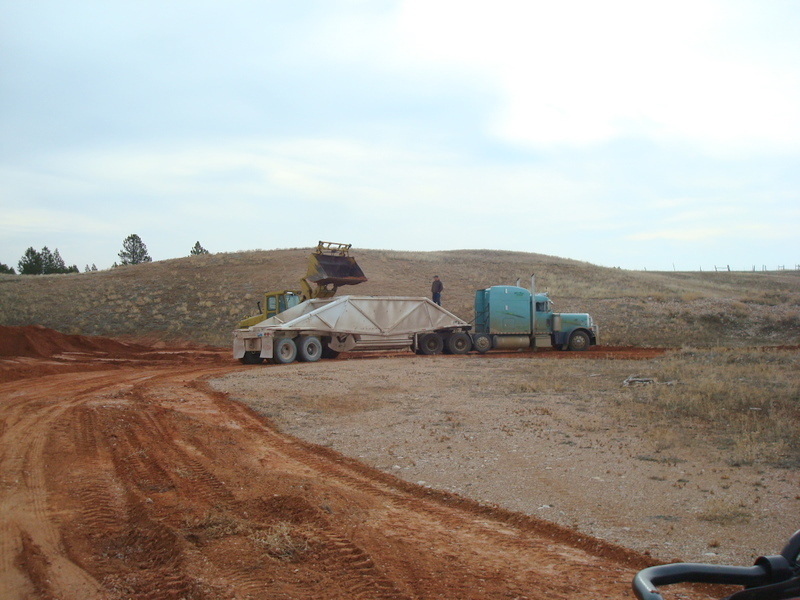 But for the last few days we’ve put him to work and they’ve hauled lots of gravel. Our driveway is over a mile long and after 30+ loads they still haven’t made it to the house. Thank goodness there’s still more gravel in the pit and more fuel in the tank. The best part is I haven’t had to put the pickup into 4 wheel drive since they started work. well, at least not till the snow flies next winter but that’s a long ways off. I know – you’ve all been wondering what’s happening with Nadine – our favorite camper in the whole wide world. I have been working on dear, sweet Nadine but things are moving kinda slow. The weather has not been cooperating very well and it has been too cold and wet to do somethings but I will show you what I have gotten done. First off – remember that hole in the floor by the door? All patched up and solid as a rock thanks to Nadine’s new best friend – water putty. I’m not sure what they put in this stuff but I certainly wouldn’t want to confuse it with pancake flour! This is gooooood stuff. Just like it says – it sticks, it stays put and it will not shrink. Sounds like my idea of a great guy. (Git your mind out of the gutter!) Mix it with a little water and you can fill holes and cracks in just about anything – knot holes in wood, nail holes in walls, cracks in plaster and you can use it to tighten loose joints in furniture. I know for a fact you can even fill the finger holes in a bowling ball with this stuff if the mood strikes. 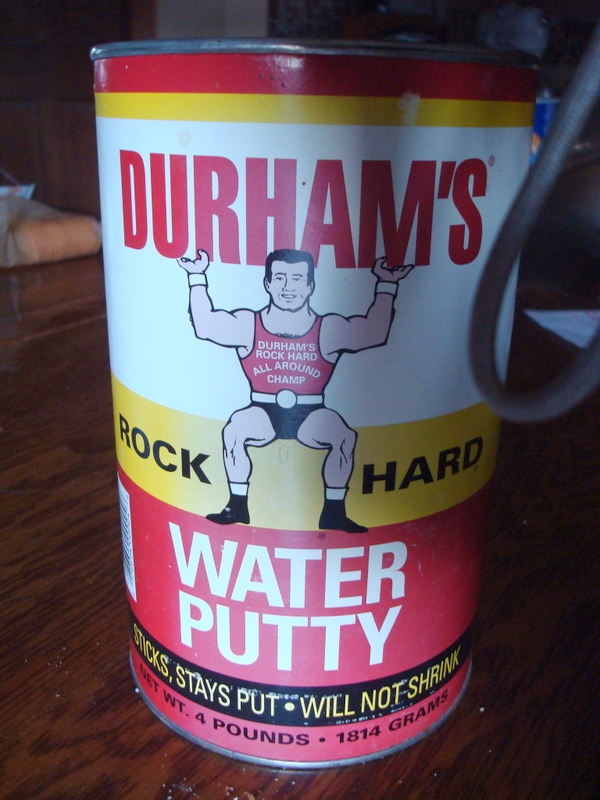 I have used this stuff for years and I highly recommend it (as does the local hardware store) and not just because of the picture of the ‘stud’ on the front – Mister Durham’s Rock Hard All Around Champ, himself. Admit it – he’s a stud and he knows it. Just looking at this label made me run to my computer and check out their website. Usually, things with advertising like this are either really good or only sold in specialty stores (if you get my drift…) but there’s some very interesting stuff I didn’t know – like the Champ’s name is “Rocky”. (of course it’s Rocky – what else would it be?) I also learned you can fill empty egg shells to fool large exotic birds in zoos and cast replicas of ancient Native American pottery. And I won’t spoil it here but if you wish to see a new and ‘beefier”‘ Rocky complete with hairy arms and legs you’ll just have to check out the web site yourself. www.waterputty.com Then you too can impress your friends with your amazing knowledge of water putty just like me. Yep – from the looks of things, Nadine just might develop a ‘solid’ relationship with Rocky by the time we finish this project. 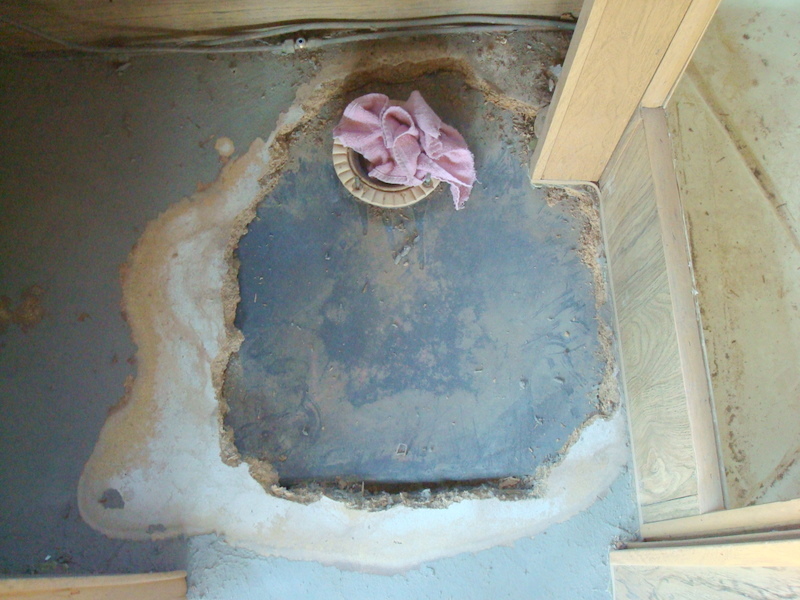 We seem to have a small hole in the bathroom floor. OK – half of it is missing. When I peeled off the linoleum, the particle board underneath was very, very rotten. And by the time I cleaned out all the rotten stuff I had a pretty good view of the septic tank. Lovely – isn’t it? I’m not quite sure how I’m going to fix this one but I’m working on it. The main thing is that it has to be solid enough to support me as I’m sitting there contemplating the meaning of life. I would really hate, in the middle of the night, to end up in the tank. A thing like that could really spoil your whole outlook on life. I’m sure we will figure out something but until then I must admit there have been a couple of ‘redneck’ repairs going on too. 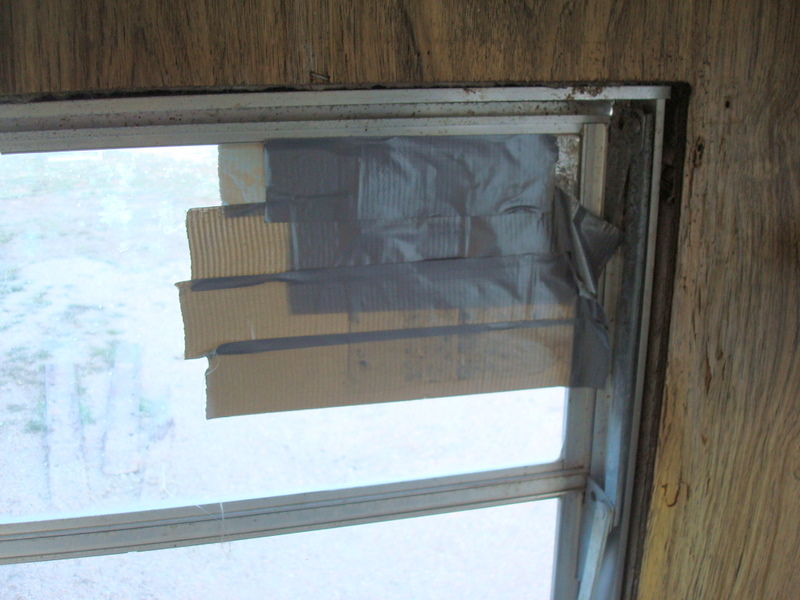 Duct tape is a wonderful thing. Can I get an ‘Amen’ from the choir? I’m really surprised Martha Stewart doesn’t use more of it. Come to think of it, I don’t believe I have ever seen duct tape mentioned in her magazine or on her show. She obviously hasn’t researched the vast and varied uses of duct tape. Perhaps someone should drop her a note and let her in on this little secret. I’m sure her whole Christmas theme would take a detour into the wonderful world of duct tape next year and just imagine what she could do for Halloween. Sorry – I kind of took a detour there myself. Don’t panic, this really isn’t the final repair for the window. I wouldn’t do that to Nadine but at least it will keep the moisture and snow out until I can get her licensed and pull her somewhere to get it fixed right. It’s not permanent but it will work just fine for now. Nadine also has new ‘redneck’ lawn furniture too! It’s ‘redneck’ because I found it in the road ditch last night. No – really… I did. Looks pretty good for road kill. It must have flipped out of the back of someone’s pickup and obviously, it didn’t ‘bounce’ very well because the parts were scattered on both sides of the road. It was beside a very busy Wyoming highway but I risked it. Fortunately, it was after rush hour. Ha Ha Ha!!! Rush hour in north-east Wyoming? Ha Ha Ha!!! I had just enough time (about 37 minutes) to gathered up the pieces before anyone else drove by and called the cops to report a crazy lady in the road ditch, wandering aimlessly and looking lost and disoriented. Once I got the parts home I took out the twisted screws and put her back together with shiny new ones. Now it looks pretty spiffy sitting next to Nadine. Maybe next week I can find an old toilet to plant herbs in. Yes, (I hang my head in shame) I’ve done that before too. Now, I don’t want you thinking I’m the only one in this family who drags home ‘interesting’ things, this is also parked in front of my garden shed and I didn’t put it there. It may not look like much but it runs like a scalded dog. Our youngest son found this treasure and he has plans to fix it up. I say all it needs is a couple of cans of spray paint then we could hitch her up to Nadine and hit the road. 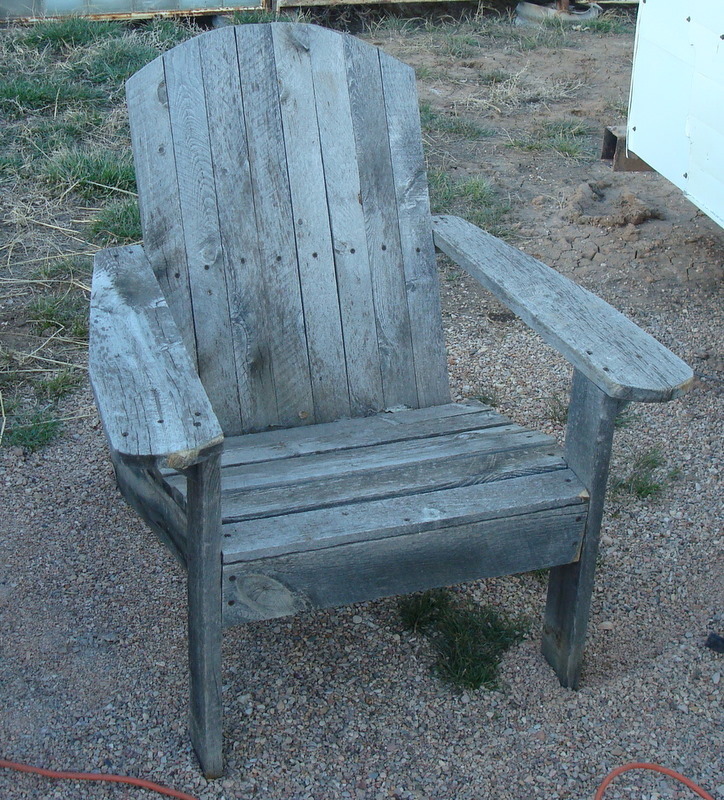 Heck, we could even strap the new lawn chair to the flat-bed and I could ride in style – just like Granny Clampet. Friday night I came home to a problem – no running water in the house. This is bad. Water is something we’ve gotten rather used to. I guess, technically, we still have water. It’s falling from the sky so we’re not quite as bad off as some and I guess I can always wash my face in the bird bath – I don’t think the birds would mind too much – as long as I fill the feeder while I’m out there. But thank goodness I didn’t have to upset the birds. 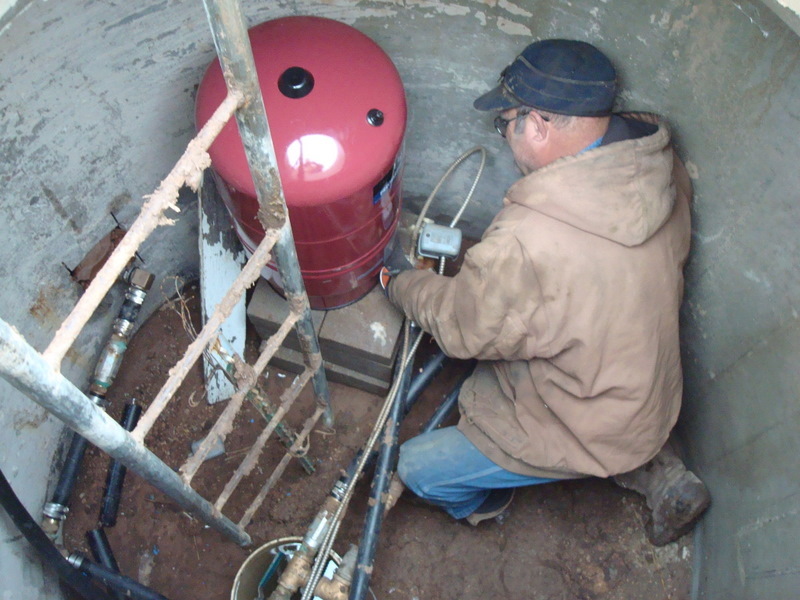 Hubby discovered what the problem was – a leak in the pressure tank that had sprayed water all over the electrical stuff down in the well pit. Since water and electricity are not very friendly to each other the breakers had tripped (like they are supposed to) and shut everything down. So early Saturday morning we made some calls and found a new pressure tank at the hardware store 16 miles away and I made a quick trip to town and brought home a shiny new red pressure tank. Just like our last ‘date night’ (remember the ball joint on the Ford pickup) Hubby and I got to spend some quality time together fixing the plumbing. Pretty darn romantic isn’t it? Here’s my man in the pit – yes, it’s a hole in the ground and in the summer you might find salamanders down there sometimes but luckily no snakes so far. After a quick switch-er-oo life is good once again and we have water. And the girls are just as pleased as we are – look at them. They came running as soon as we pulled up to the well pit – which just happens to be beside one of the stock tanks – where the girls hang around and visit. Cattle are actually very curious creatures. 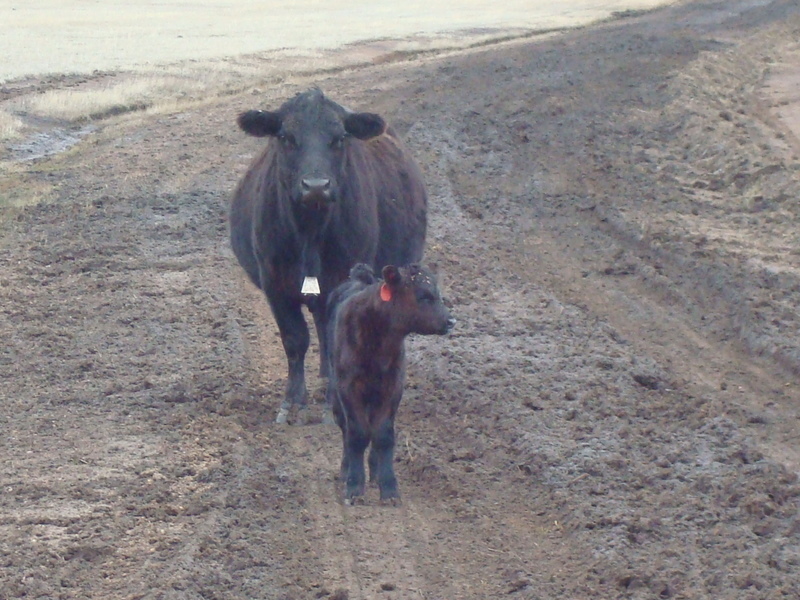 They were bunched up pretty close – checking out the pickups, the well pit, and especially the stock tank because the water was getting low there too. You see, when we don’t have water in the house – they don’t have water in the tank. They don’t like it either. Everybody on the place starts to get a little antsy when that happens. But even more amazing than running water – check out what I saw in the tank as I was checking for running water. 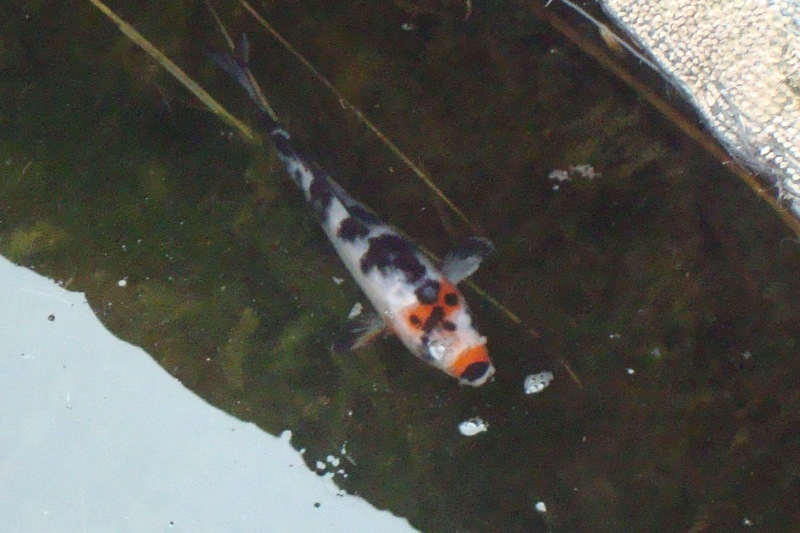 That’s a Koi (goldfish) in the stock tank. If I remember right – 3 summers ago I had a small tank set up in the garden because I love goldfish and every garden should have some – right? Well things went good all summer but when it started to turn cold in the fall I had to drain the tank or it would freeze solid and split out. I have owned several aquariums over the years but that fall the only ones we had both had small leaks so I filled them with plants instead. So what where we going to do with the Koi fish? That was the question. Hubby came up with a great idea, he suggested we throw them into one of the stock tanks. These tanks are not heated in the winter but they are built from huge old tires off of heavy equipment and if you build them right – the water rarely freezes. First, you lay down the big tire, cut a hole (for the cattle and horses and wildlife to drink from) on the top edge of one side, fill the center hole on the bottom of the tire with bentonite (a mineral that is heavy and gets really slimy when wet and will pretty much seal off the water from escaping into the ground. 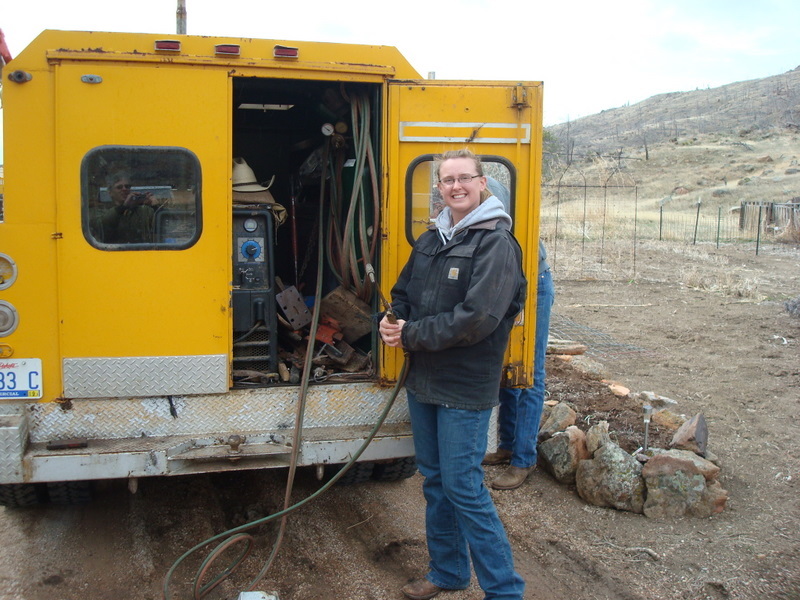 Then you set up a float system so the water shuts off automatically when the tank is full (like in the back of a toilet), cover the center hole on the top of the tire with lumber and bury as much of the tank with dirt as you can while leaving the spot open for the cattle to drink. Pretty simple. I wasn’t sure if the fish would survive but at least they would have a chance so we set them free in their new stock tank and pretty much forgot about them. The next spring I asked Hubby if he had ever seen the fish through the winter and he just shook his head and we figured they were gone. If the cold hadn’t got them probably a snake or something else had. So we pretty much wrote them off – at least until Saturday morning when this little guy swam right out and said hello. He’s gotten a lot bigger then when we put him in and he’s kind of pretty thing. I think we’ll name him Spot. I’m not sure if the second one is still in there but we just might have to figure out a way to catch them. Maybe it’s time for another tank in the garden.